i think the red cord is not the concern... the power strip likely isn't rated for enough amps for that compressor. When I tested the compressor I had it plugged up to the power strip but if I were to use it on a regular basis, I would just plug it directly to an outlet. The power strip does have a circuit breaker in it though. Keep in mind also that since this compressor has a fixed hose with a tire inflator tool on it, no quick releases on either end of the hose, I will more than likely only use it sparingly for maintaining tire pressures for now. that's cool. That 1hp is a good handy size too. years ago i did a lot of painting and body work with one that size. Right: A 1 hp, 120 volt air compressor motor is right at the max operating level for a 120v 20 amps ckt. Intermittent use for airing up a tire will be a good thing when on a 120v circuit. This is why a one hp and larger air compressor electric motor is more user friendly when on a 220 volt ckt. Just a heads up notice you need to be aware of that I casually mentioned earlier. That is why I mentioned previously that I installed and use a downstream air regulator (for use when I want regulated air pressure for a spray gun, etc) and I can just leave my OEM on board compressor vintage wimpy regulator set at max and do not ever change it's setting. Here is type air filter, regulator with gauge I'm referring to use downstream if you ever need regulated air and not bother your OEM reg setting. The cheaper one's like this unit are throw away when they go south but give good service for intermittent duty. 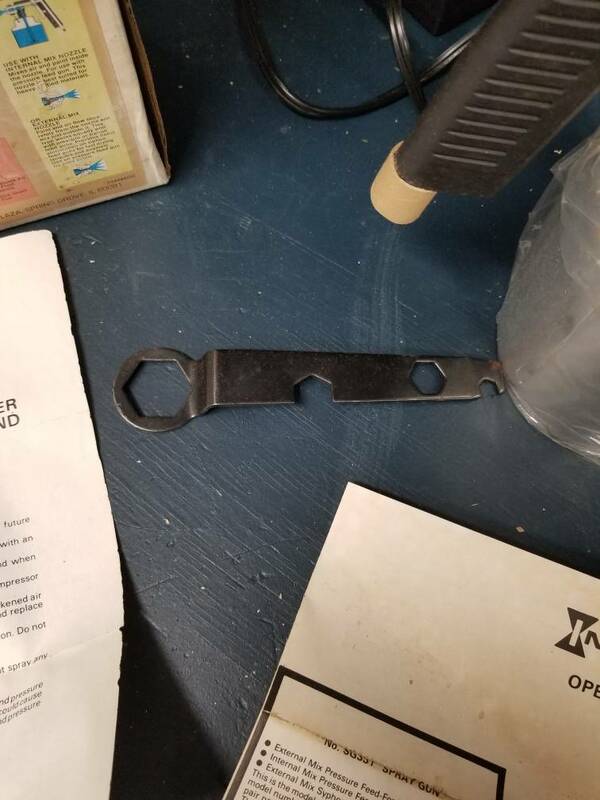 Source for parts for yours if you ever need such. I got some Sanborn parts in 2012 from these people. 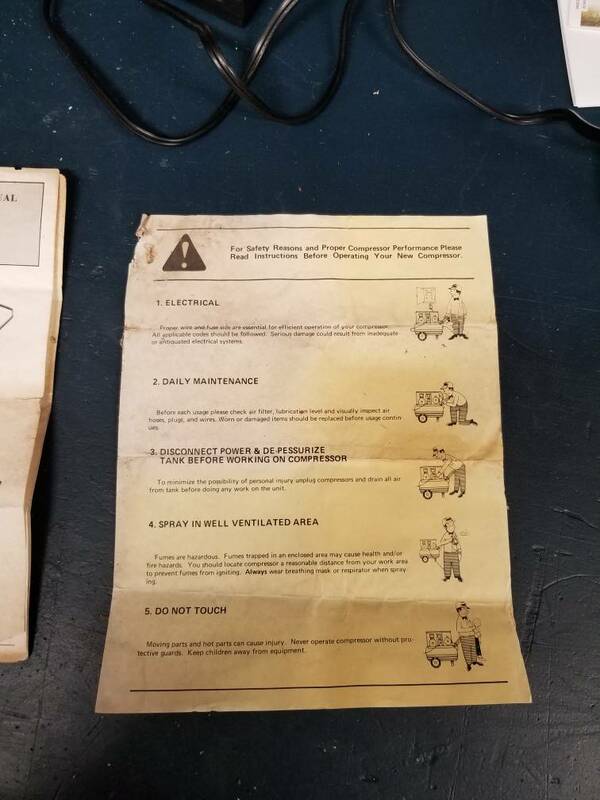 Lots of this cross reference info I printed and saved for my use came from the Sanborn air compressor site which I could not even find now days. 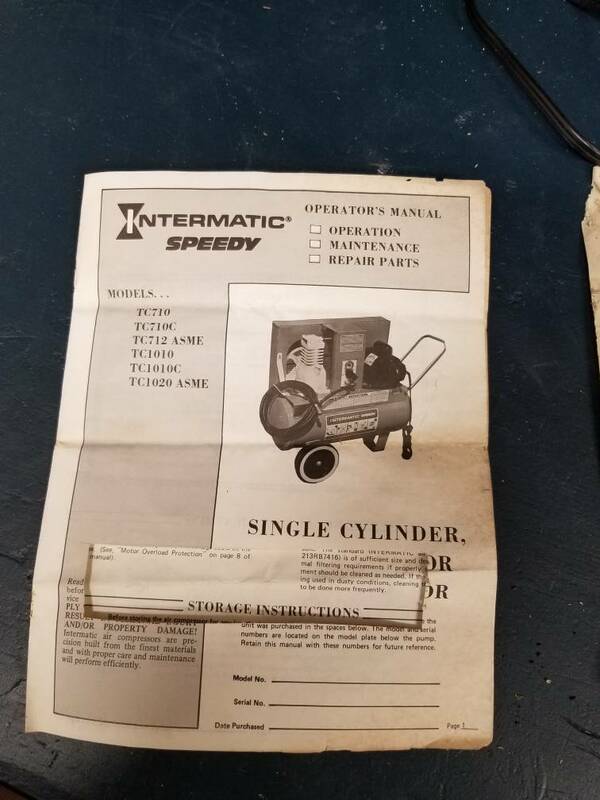 (maybe you can find it It is called a Sanborn air compressors Model No. CROSS REFERENCE GUIDE. Hey thanks. I haven't messed around with the compressor this weekend, I want to change the oil before I use it again. 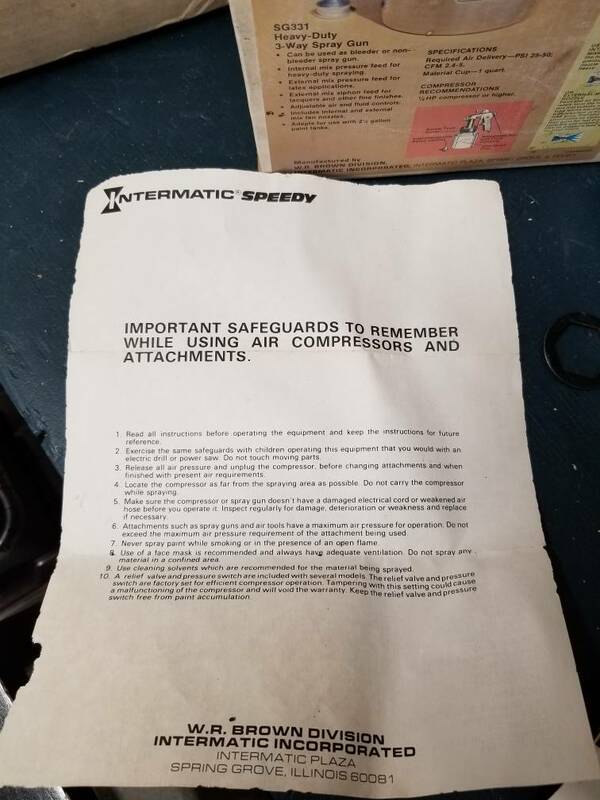 I was helping my Mother clean out my Pawpaw's shop the other day and found the manual for the air compressor. 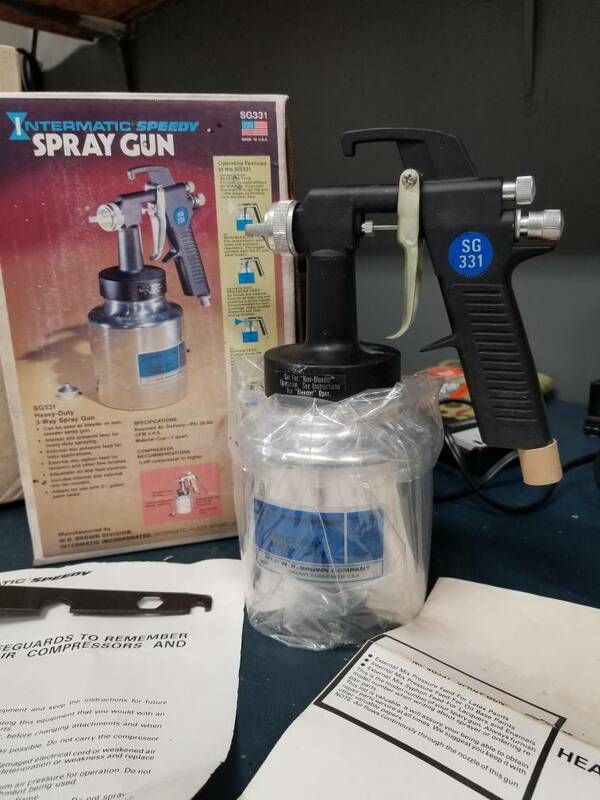 I also found a paint spray gun made by the same company as the air compressor. 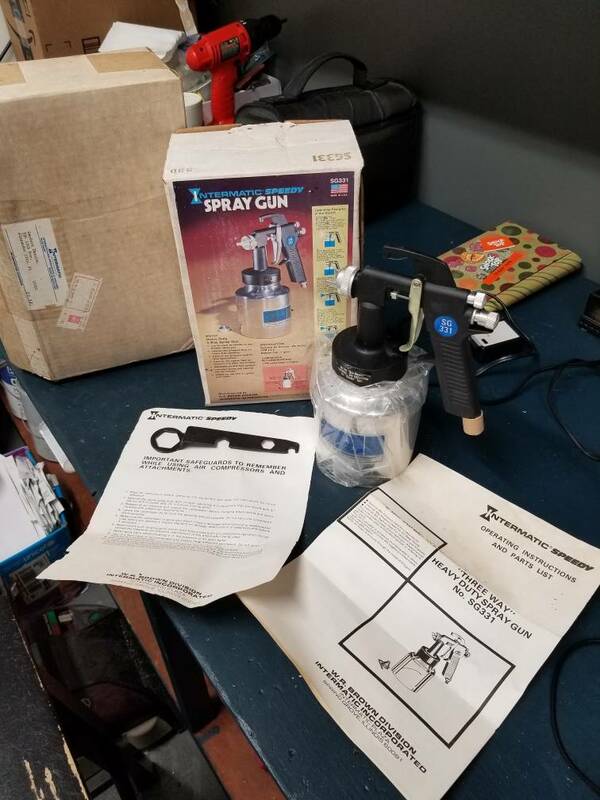 The spray gun is still in its original box inside a shipping box, apparently Pawpaw ordered the spray gun and it came in the mail. 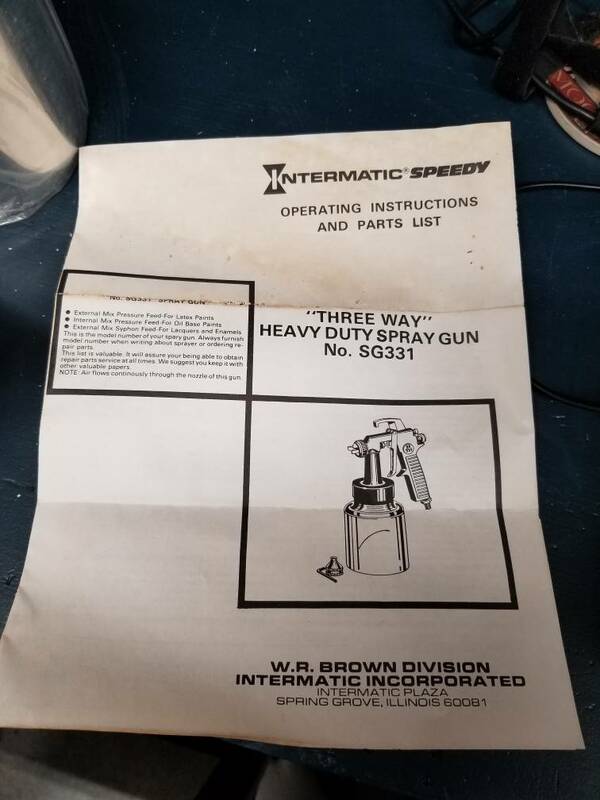 The UPS label on the box is dated September 6, 1983, my Pawpaw passed away in May of 1984 so, this spray gun was never used. I never knew he had this spray gun and it was kind of hidden behind some tool boxes on a shelf under his work bench. I don't know if I will even use it, but for now, I'm just happy to have found it, and now it is reunited with the compressor. Hope y'all enjoy the pictures. Hang onto that comp parts list. the part numbers are still good ones. Keep in mind what I told you earlier about the comp air regulator. Use a external air regulator if you need regulated air for example for the 40 lb pressure spray gun. 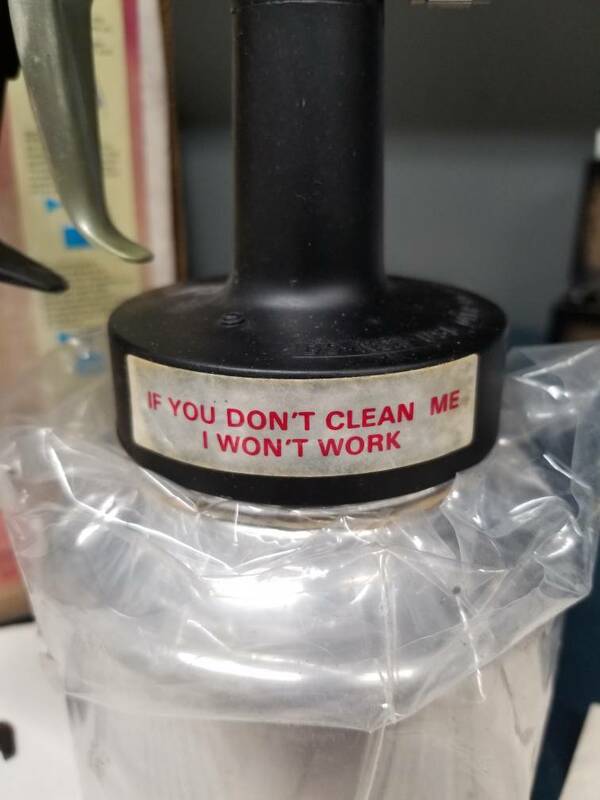 That sign on the spray gun speaks the truth.